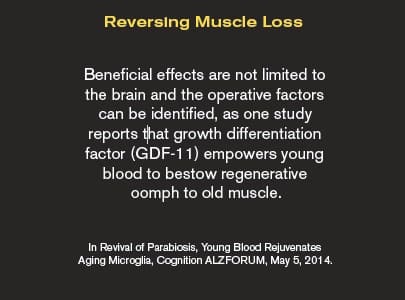 To give you an idea of advances happening at prestigious universities, a protein found in the blood of young animals called GDF-11 is inducing systemic rejuvenation effects on bone, muscle, heart, blood vessels, and brains of older animals. “GDF” stands for growth differentiating factor. It functions to turn “on” senescent stem cells, which results in a restoration of youthful structure and function to senile tissues. This same protein (GDF-11) is found in young humans as well as animals. 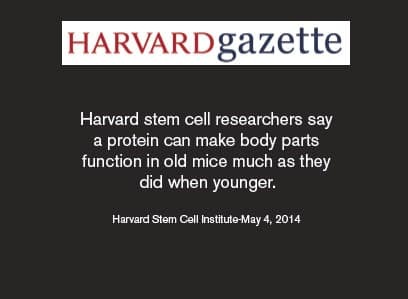 Harvard, Stanford, and other universities are conducting remarkable studies showing age reversal in animal models. Researchers from these centers of medical innovation are optimistic that this approach might be applicable to humans. The Power Point presentation that follows next describes an age-reversal study that offers potential for quick clinical results, meaning the therapy could be readily implemented to spare aging individuals from premature extinction. While the Life Extension Foundation is committing funding for these projects, we need help from our supporters. I look forward to hearing your feedback after seeing the following PowerPoint presentation that begins on the next page. Historic Human Clinical Study— Scientists On Verge Of Something Big! In the January 2015 edition of Life Extension® magazine, you were promised announcements about breakthrough opportunities for the reversal of age-related disease. While supplements that Life Extension members have been taking for decades provide substantial protection, never before have we had such an arsenal to counteract the multiple underlying factors that characterize degenerative aging. A radical shift has emerged on the scientific front. This has prompted Life Extension to help coordinate the first clinical study of its kind that will attempt to significantly reverse aging in frail elderly humans. The method employed will be to recruit young donors and mobilize their bone marrow stem cells. The blood of these stem cell-mobilized individuals will be separated into a plasma concentrate that will contain factors thought to convey youthful health and vitality. 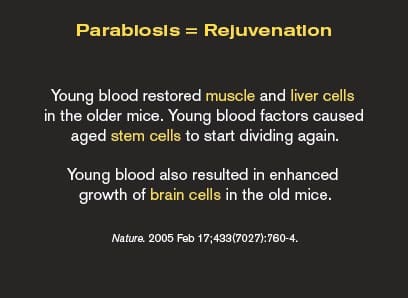 These youth factors will then be transfused into elderly individuals with the objective of inducing meaningful and sustained restoration of youthful function and tissue structure. To date, the Life Extension Foundation has donated $800,000 to the South Florida Bone Marrow/Stem Cell Institute to study the use of this technology in advanced cancer patients. Life Extension is providing additional funding to get this project off the ground. In order to aggressively move this project forward, we need to raise pledges from those who want to see this game-changing technology emerge for humanity and themselves. 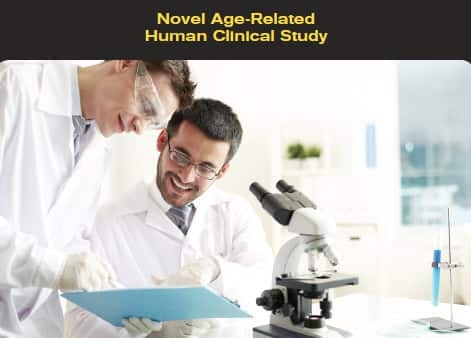 The following pages are a PowerPoint presentation that provides an overview of the scientific rationale for conducting this unprecedented age-reversal clinical study. 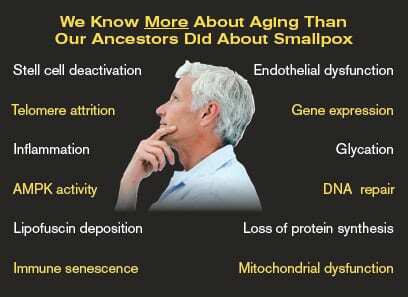 Scientists today have considerably more knowledge about aging than what doctors knew about smallpox when the smallpox vaccine was discovered in 1796. 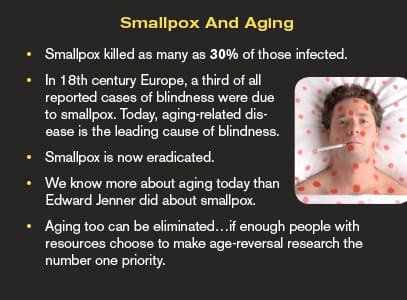 Yet aging is still the leading cause of disease and death in the civilized world. The good news is that there are at least some ways to slow down pathological aging, but no practical protocol to meaningfully reverse it. 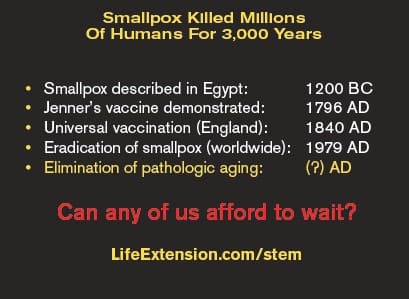 Smallpox was eradicated in regions of the world where universal vaccination was employed. 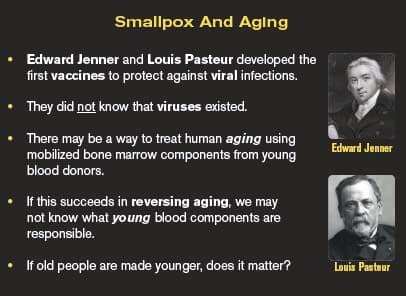 This was accomplished before scientists knew there was a smallpox virus. 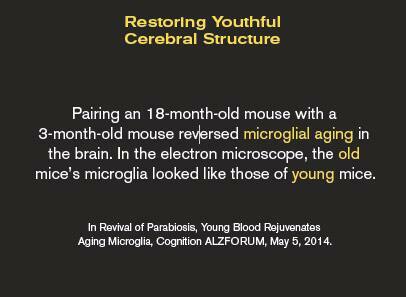 There may be a way to reverse aging before knowing what specific components of young blood are responsible. 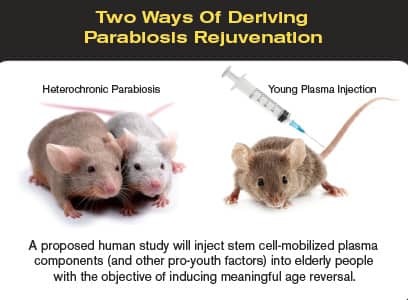 Parabiosis research has demonstrated profound age-reversal effects in laboratory animals. It may do the same for humans. For the proposed human clinical trial, bone marrow-enriched plasma from young donors will be injected into elderly people. Other “pro-youth” factors may be added. 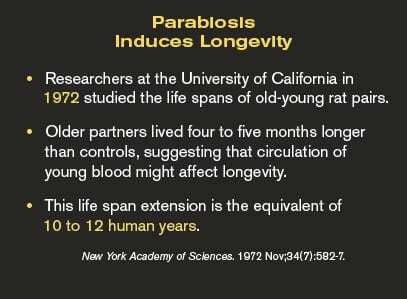 Parabiosis was shown to confer longevity 43 years ago. Newer studies have identified specific rejuvenating factors contained in young blood. 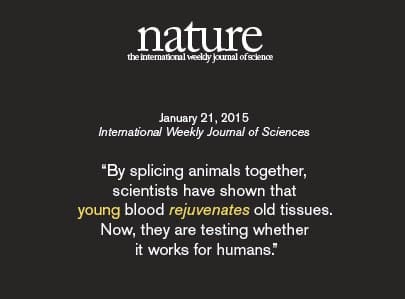 Recent studies are demonstrating a powerful age-reversal effect in response to delivering young blood to old animals. 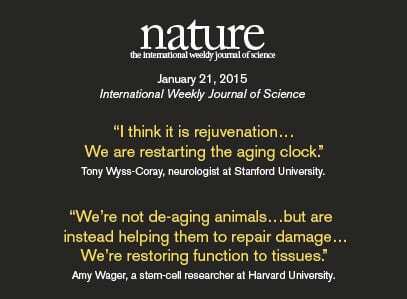 These results indicate the potential for systemic (whole body) age reversal. 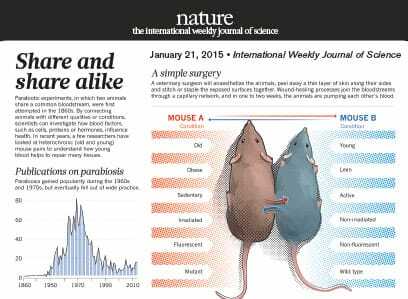 Mainstream scientists opine on potential of parabiosis-type technology. 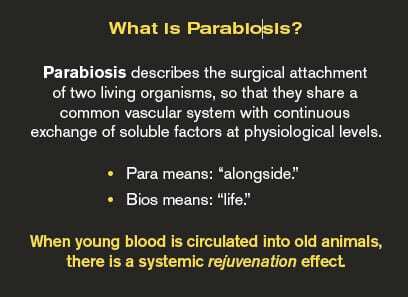 Parabiosis research peaked in the early 1970s and then stopped inexplicably. A resurgence of interest has ensued over the past three years. 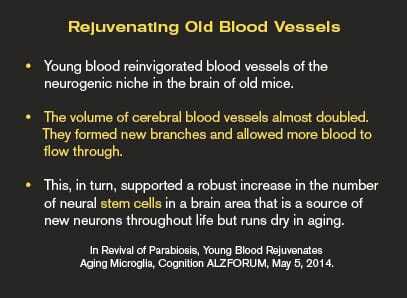 Numerous published studies now validate the rejuvenating effects when young blood is infused into old animals. 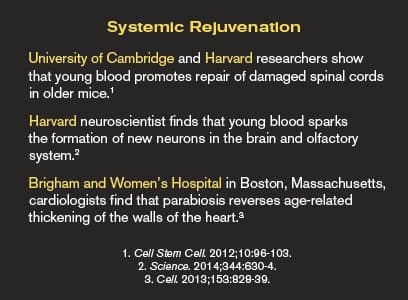 Young blood contains proteins that prompt old stem cells to start dividing again, which has a systemic age-reversal effect in animal studies. 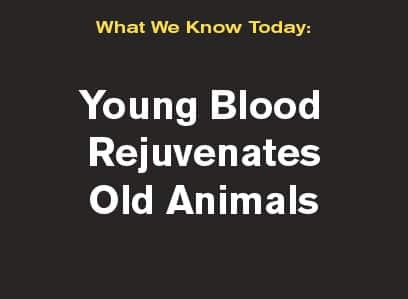 Researchers at prominent universities are validating multiple age-reversal effects that occur when young blood is transfused into old animals. 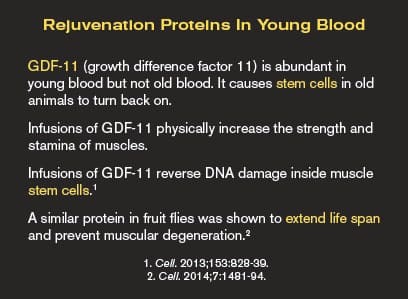 GDF-11 is a protein found in young human blood that disappears as people age. Transfusing bone marrow-mobilized young blood components into older people is likely to yield high levels of GDF-11. Five million Americans suffer today with congestive heart failure. 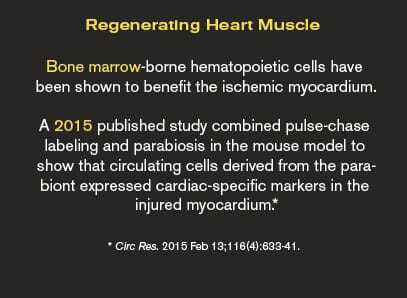 Bone marrow-mobilized young blood may reverse this pathology. Endothelial dysfunction is the Achilles tendon of aging humans and a causative factor in most strokes. Young blood may reverse this pathological condition. 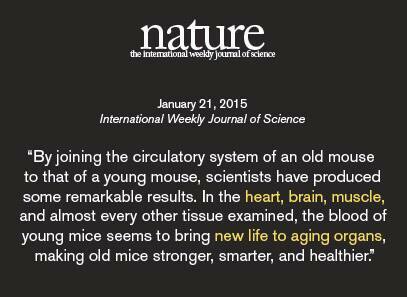 Making old tissues function in a younger fashion. Sarcopenia (loss of muscle mass) is epidemic in elderly populations and is a factor in frailty encountered by humans as they grow old. Young blood components might reverse sarcopenia. Microglia are a type of cell of the brain and spinal cord that act as the first and main form of active immune defense in the central nervous system. 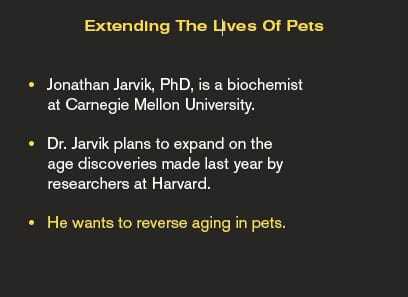 Dr. Jarvik wants to try transfusing young blood components into old pets to reverse their aging process. 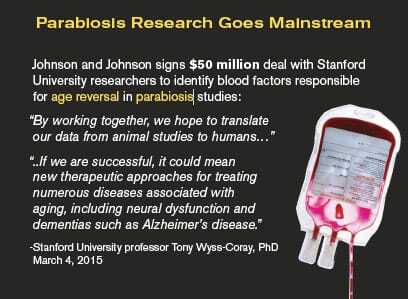 Mainstream pharmaceutical company is seeking to develop patented drugs to mimic parabiosis research. First proposed human clinical study to reverse aging. Funding needed to consummate study that seeks to reverse aging in elderly humans. If systemic age reversal can be documented in this study, the race to translate these findings into practical medical applications will begin. 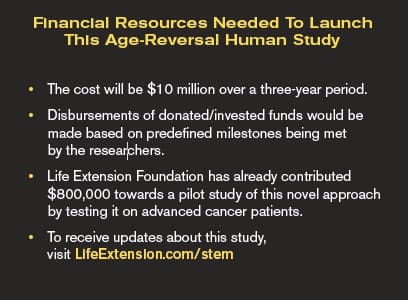 Life Extension Foundation is contributing funds for this study, but we need help from like-minded individuals to afford the high cost of conducting this study over a three-year period. The reason the expense of this 30+ subject study is so high is because of the costs associated with enrolling young compensated donors, the extensive blood testing, the stem cell-mobilizing drugs, and close medical supervision over the course of the study. 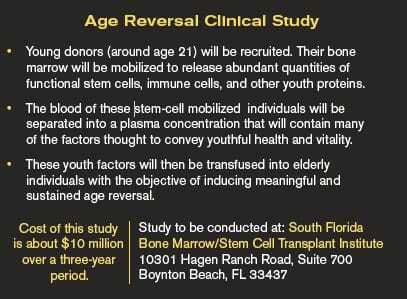 Elderly participants in this age-reversal study will require a monthly visit to the South Florida Bone Marrow/Stem Cell Institute for an infusion of stem cell-mobilized components from young blood donors. From a convenience standpoint, supporters living in South Florida are the most likely beneficiaries, though individuals with only a short time to live may consider flying to South Florida monthly for the youth factor infusions. The South Florida Bone Marrow/Stem Cell Institute is located in Boynton Beach, Florida, which is about a one hour drive north of Ft. Lauderdale and less than 45 minutes away for most residents of Palm Beach County. Those wanting to help support this ground breaking study should log on to LifeExtension.com/stem. Those making pledges might also be able to participate as recipients of the youth factor infusions if they satisfy the study’s eligibility criteria. If this study is successful, it will be impossible to meet the demand that may occur as tens of millions of elderly individuals will clamor to get it. (Think of the movie “Cocoon.”) Longtime Life Extension supporters will be given priority whenever possible. To make a pledge and/or inquire about participating as a compensated young donor (under age 23) or elderly study participant, log on to: LifeExtension.com/stem or call 1-800-544-4440 (24 hours).